One of the things I’ve decided to make a priority this year is not leaving myself at the bottom of the priority list. 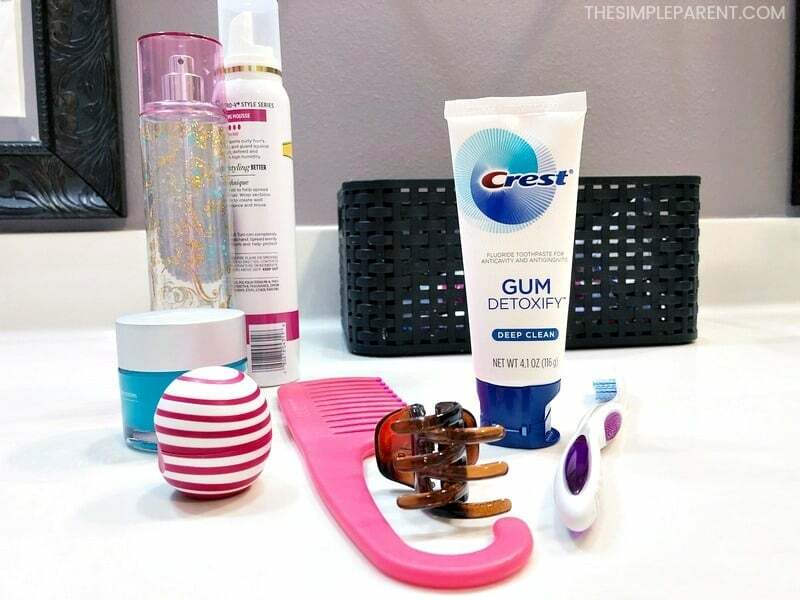 As part of this, I’m partnering with Crest to share some easy self-care ideas busy moms can incorporate into their days. This is a sponsored post, however all thoughts and opinions are my own. I feel like self-care has become a hot topic these days and for good reason. We all live such busy lives these days that it can be so easy to burn out. It’s easy to put ourselves at the bottom of the priority list. If we don’t take care of ourselves, we won’t have enough to give to everything we do for our families. So it’s definitely important. Taking care of myself both physically and emotionally helps me handle both the small and big responsibilities I have as a working mom and wife. The biggest issue I have is that I sometimes feel guilty when I take time to take care of myself. If you’ve ever taken a long bath and felt guilty about it, then you know what I mean. But the truth is that we shouldn’t feel guilty at all. I just want to be the best I can be for my family which is why self-care is important! When it comes to self-care strategies, I focus on the big areas that I know are important for me on a daily basis. These are my main categories for making my list of self-care ideas that I will actually use! Write down your basic self-care strategies and it will help you narrow down more specific activities to help you in each area! If you need help coming up with some self-care ideas that appeal to you, check out this list of some of the ideas my mom friends and I chat about a lot. That guilt I mentioned earlier? 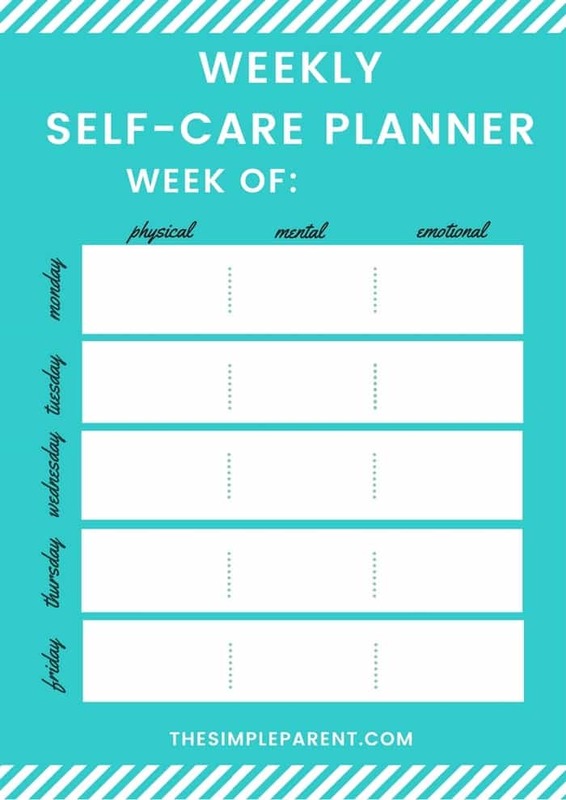 The best way I’ve found to combat those guilty feelings is to have a self-care plan that is full of easy ideas! Having a plan or strategies can make self-care part of your daily life. 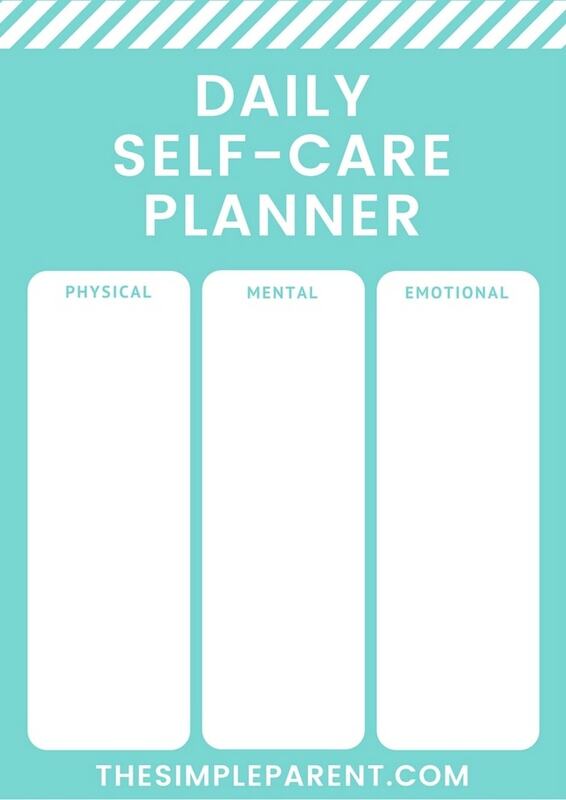 You can download our free printable daily planner for your self-care ideas to help you get started! Once I made my list of ideas, it was easy to develop a self-care routine to make sure I’m a priority in my life this year. There are a few different ways to develop a self-care routine that works for you (for more than a day)! If you need to start out really simple, a calendar works great. By adding one of your self-care activities to your day, you can keep yourself on top of your game emotionally and physically! One day at a time we can all avoid running on empty! Once you’ve got your strategies in place for your daily life, don’t hesitate to plan an entire week! We’ve got a weekly planner you can print for free to help you stay focused! Click here to download your weekly planner printable. If you’re looking for a super simple, basic self-care routine, try this daily checklist. I’ve been doing it since the start of the New Year and it’s helping me feel more balanced. Sleep when you’re tired. This can be hard in the middle of my family’s busy day but getting enough sleep is often the difference between a good day for me and a not so good day. Setting a time to go to sleep and a time to get up every single day seems to help me with this. I didn’t follow this over winter break with the kids and I found myself feeling exhausted by the time the kids went back to school. Get moving every single day. 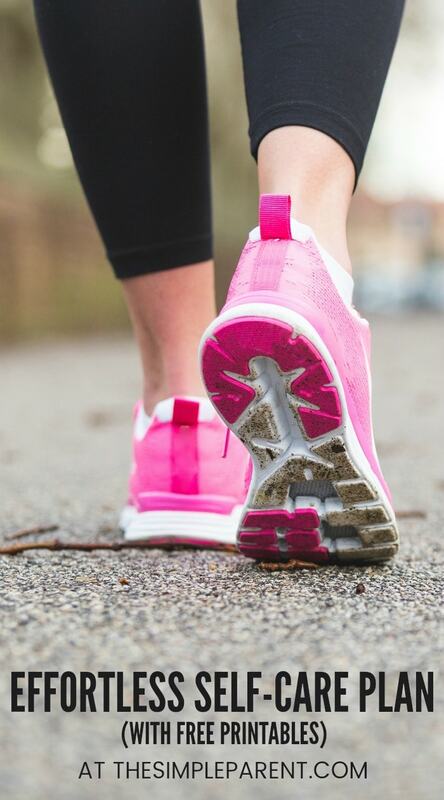 Find a way to add some movement or exercise into each day. It could be a hard workout or just a walk around the neighborhood. Even dancing to music with the kids goes a long way to helping me feel my best. Eat when you’re hungry. I’m an emotional eater so this year I’m focusing on paying attention to my body and what it’s telling me. I feel better when I eat when I’m hungry and stop when I feel satisfied. Acknowledge your feelings. This has a lot to do with guilt for me. I feel bad about not taking my kids to a birthday party. I feel bad when I travel without them. I get frustrated with Justin or Grambo. I feel like the weight of the world is on my shoulders. As part of my self-care activities, I’m working to acknowledge my feelings every single day and not bottle them up. Doing that only leads to more stress and wears me down quickly! Take 5-10 minutes to yourself. Take at least five minutes every single day for yourself. Let the supportive people in your life help you find the time and shut the door for at least five minutes. Just sit and relax in the quiet if that’s part of your self-care plan. Read a book, listen to your favorite song, write in a journal, or just do absolutely nothing. One the easiest things I’ve added into my self-care routine has to do with my morning and evening bathroom routines. By adding just a few minutes to my morning (and getting some help in the evening), I’ve turned basic activities like washing my face, brushing my hair, and brushing my teeth into a true self-care routine. I don’t wear a lot of makeup, but that could become part of the routine too. By working to set up time where you don’t have the kids hopping around while you quickly run a brush through your hair and then get your teeth clean, it can be a relaxing way to start or end the day. 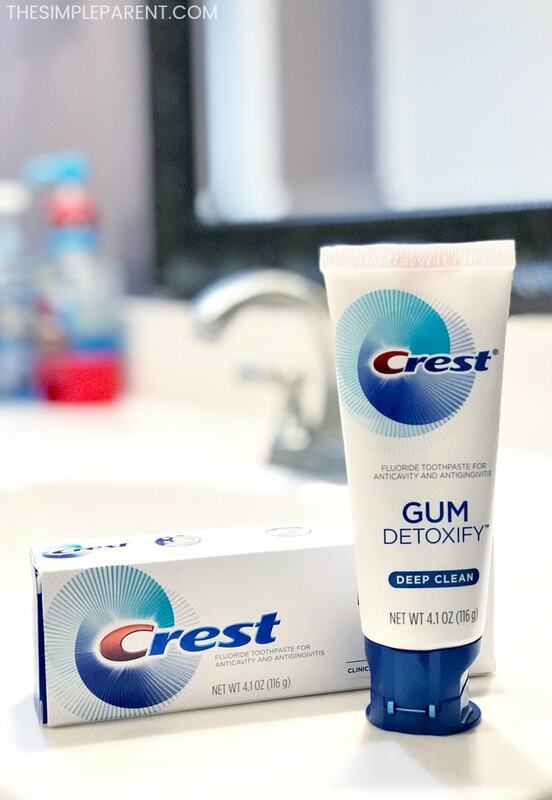 Crest Gum Detoxify is a brand new product from Crest and it’s one that caught my eye immediately. Did you know that there are millions of harmful plaque bacteria that can lurk around the gum line and cause gingivitis? I’ve dealt with some gingivitis in the past, so gum health is huge for me. 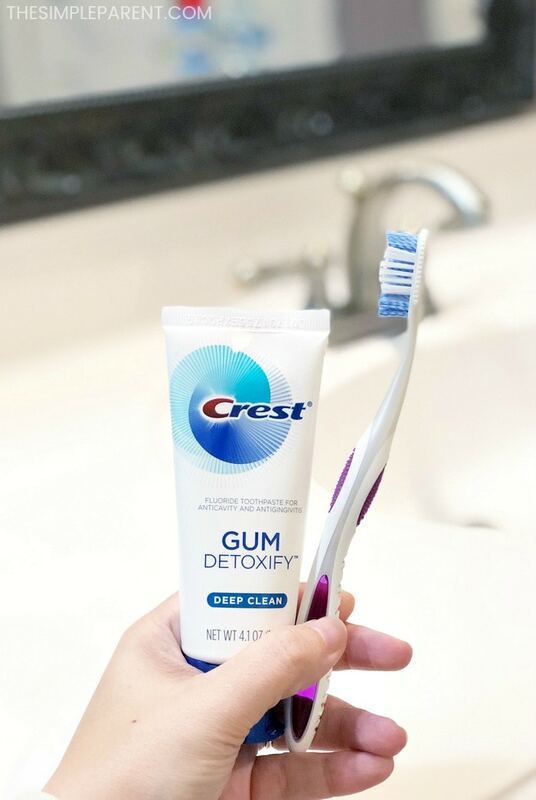 Crest Gum Detoxify Deep Clean Toothpaste has activated foam technology that penetrates hard to reach places to neutralize harmful plaque bacteria even around the gum line, for clinically proven healthier gums. If oral care is important to you, Crest is here to help and can become an essential part of your daily self-care routine. I encourage you to take some time this year and figure out how you can turn things you do daily from chores into ways that you take care of yourself. Now I enjoy my few minutes in the morning as I get ready for the day. I’m able to look at myself and smile, which is a great way to get each day started! #ForGumsSake, it’s one of the easiest self-care ideas I’ve come up with this year!